Flood has always been a two-edged sword. The annual flooding of the Nile contributed to the historical fertility of the region. Floods, however – whether in the form of tidal waves, tsunamis, or rivers overrunning their banks – are also one of the most powerful and destructive natural forces. According to the Biblical account of a worldwide flood, the flood of Noah’s day would be the largest single weather-related catastrophe in history. The flood triggered a substantial climate change, which, in turn, created future conflicts. The impact of the flood – whether examined as a local or a worldwide phenomenon – created ripples of change to which even modern societal systems can be traced. This case study will consider the history and implications of ancient flood stories, focusing primarily on the Genesis flood, and will look at the use of water as a weapon over the ages. The use of the flood as a weapon can be examined in four areas: a weapon of God, a weapon of war, a weapon with future possibilities in violent conflict, and a weapon which we have turned against ourselves. The Genesis flood is one of the most widely debated Biblical accounts, arguably second only and related to the creation account. The purpose of this case study is not to add to that debate. Rather, it will examine the impact a Genesis flood would have on the society of the time. In the Biblical account, as recorded in the 6th – 8th chapters of the book of Genesis, God decided to punish mankind for wickedness by destroying the earth, saving only Noah, who “found favor in the eyes of the LORD.” At God’s command, Noah made a large boat, taking his family and samples of all land animals on board the craft to ride out the coming flood. According to the Biblical account, the “windows of heaven” and the “fountains of the deep” were opened, and the rain lasted for 40 days and 40 nights, with the water rising to cover the mountains to a depth of approximately 23 feet. The waters were on the earth for over a year, at the end of which time Noah sent a raven and a dove to fly over the earth to determine if the waters had abated enough to exit the ark, which had settled in the mountains of Ararat. After the second flight of the dove, Noah and his family left the ark and prepared a sacrifice to God. They were commanded to “be fruitful and multiply upon the earth” to replenish the population, and a rainbow was given as the sign of God’s covenant not to destroy the earth with water again. According to Ian Wilson, the astonishing number of parallels between the stories suggest that they came from a single source.10 There are two prevailing theories as to what that source was: the Black Sea flood theory and the Genesis account. There are two prevailing theories as to what that source was: the Black Sea flood theory and the Genesis account. Both suggest that the widespread examples of catastrophic flood stories are due to survivors of the flood which inspired the stories -- in the Black Sea flood theory, a local flood in the area of the Black Sea; in the Genesis account, a worldwide flood that left eight survivors. 3. Beginning Year: Around 6000 B.C. Whether one subscribes to a worldwide flood as the Genesis account or to a series of localized floods, as described in the Black Sea theory, there are a number of different actors involved. According to the Genesis account, the whole world was involved. Scholars are in agreement that, in the past, the level of the earth’s oceans was much lower than at present. There is little doubt that the ocean rise can be accounted for by glacial melt at the end of the Ice Age. Ryan and Pitman suggest that the Black Sea flood was caused by a break-through of the rising Mediterranean, due largely to glacial runoff. This seems a thoroughly reasonable explanation of the cause of the Black Sea flood, based on the scientific evidence that Ryan and Pitman detail in Noah’s Flood, as well as the arguments set forth by Wilson. The purpose of this case study is to examine how the Genesis account would explain certain natural and sociological phenomena. However, the Black Sea flood theory is certainly a viable, logical theory. How, then, can those who believe the Genesis account reconcile the two? If both the Genesis account and the Black Sea flood theory are assumed to be true, where is the link? They suggest that the lingering atmospheric pollution from volcanoes, combined with a lack of atmospheric carbon dioxide as a result of vegetation decline, contributed to the rapid formation of large glaciers and polar ice caps.16 Earlier in the book they quoted meteorologist Fred Hoyle on the probable cause of the Ice Age: “Evidently then an ice-age would arise if the greenhouse effect of our atmosphere were destroyed or seriously weakened.”17 Whitcomb and Morris suggest that the rebalancing of the global warming system led to a increase in global temperatures and a rapid glacial melt – the very same glacial melt that triggered Ryan and Pitman’s Black Sea flood. This case study offers the opportunity to consider both the direct and the indirect impacts that nature can have on conflicts. The idea of man’s conflict with nature is an ancient one as, certainly, is that of man’s conflict with other men. Whether you agree with the Genesis flood account or the Black Sea theory, both kinds of conflict are apparent. In addition, there are a number of cultural effects that can be seen – under either the Genesis account or the Black Sea theory – that do not have a direct impact on conflict patterns, but could certainly be supposed to have some effect. What would be the cultural implications of the type of flood described in Genesis, and how might this affect conflict patterns? Conversely, what would be the effects of a localized flood as in the Black Sea flood theory? Very abruptly, the large, polytheistic world of Noah’s day was transformed to a patriarchal, actively monotheistic culture descended from one small family unit. As the descendents of Noah dispersed, the language and religious traditions gradually shifted. A number of societies trace their ancestry back to the descendents of Noah. Magog, a grandson of Noah, is regarded by present-day Chechens to be the ancestor of one of the Black Sea tribes that split after the Black Sea flood, with some moving north of the Black Sea, and others settling in the area north of the Caspian Sea.21 Genesis chapter 10 gives an account of the peoples that each of Noah’s immediate descendents founded. The list of Noah’s descendants alone reads like a list of ancient cities. The “coastland peoples” descended from the family of Noah’s son Japeth. The sons of Noah’s son Ham included Egypt and Canaan. Noah’s great-grandson Nimrod was perhaps the most prolific builder, founding Babylon, Accad (or Akkad – significant because Akkadian was an ancient language of Mesopotamia), and Ninevah in Assyria. Canaan’s territory included the infamous Sodom and Gomorrah. Wilson also suggests that the Black Sea refugees were the source of the well-known Amazons, as well as the Atlantis legend,24 and suggests that Atlas’ father Iapetus is the same person as Noah’s son Japeth, made into legend.25 Even today, the trend toward viewing natural disasters as some type of divine retribution seems to be fairly pervasive. 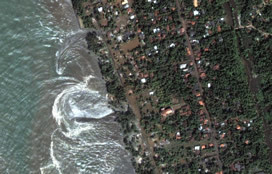 After the tsunami of 2004, which killed almost 250,000 people and caused around $2 billion in damages (see photo at right) for example, there was debate around the world (see WashingtonPost.com article)30 as to whether the tsunami was some type of message from God. Benjamin Dykes wrote an article considering how medieval astrologers would have applied their predictive techniques to the 2004 tsunami.31 Steinberg notes that after the 1993 flood, 18 percent of people surveyed in a Gallup poll agreed with the statement “The recent floods in the Midwest are an indication of God’s judgment on the people of the United States for their sinful ways.”32 Even most insurance companies classify events like floods as “Acts of God,” and will not underwrite such claims. For each of the elements, there are accounts and myths of their use as a weapon. In this case, of course, we are concerned with such regarding water. Other than the canon of catastrophic flood stories, which we have already examined, there are a number of accounts, both in the Bible and in ancient myth, of flood being used as a divine weapon. Directly relevant to the theme of conflict and the environment are the number of examples in which water was used as a weapon by armies in war. In both ancient and modern times, nature and the environment has been used by armies to inflict violence on their enemies. There are also a number of modern examples of the use of water as a weapon. The Peruca Dam (right) was damaged in the Croatian War in 1993, endangering the townspeople of Omis.36 In 1999, Yugoslavia refused to clear the Danube of war debris, putting a number of European countries under the threat of flood, unless they received financial assistance for reconstruction.37 More recently, water has been a constant source of conflict during the in the war in Iraq. In the spring of 2003, analysts were concerned about Iraqi sabotage of the country’s dams, like the dam in Qadisiyah, which would produce a “skyscraper wall of water crushing and killing for dozens of miles,” if breached.38 For more information on water conflicts, see the Sustainable Development Network Programme’s Water Conflict Chronology. The idea of weather as a weapon of the future is one that is not necessarily a distant possibility. In 1996, the US Air Force caused something of an uproar with a series of white papers that discussed the tactical advantages of weather modification. On further investigation, however, these papers were shown to be research papers done at the Air University at Maxwell-Gunter Air Force Base. While it is certainly possible that the US government has investigated or is seriously investigating ways to use weather as a weapon of offense or defense, it is difficult to find any credible evidence that confirms that fact. The future for conflict studies in this area, however, certainly offers possibilities. Whatever one may consider floods to have been in ancient times, it seems clear that many current violent weather phenomena are, in fact, weapons that we turn on ourselves through behaviors that exacerbate the natural global warming effects to an unsafe level. 1. Bible. King James Version. 2. Heidel, Alexander. The Gilgamesh Epic and Old Testament Parallels. Chicago: U of Chicago P, 1946, 2. 3. Wilson, Ian. Before the Flood: The Biblical Flood as a Real Event and How it Changed the Course of Civilization. New York: St. Martins, 2002, 19. 5. Heidel, Gilgamesh Epic, 9. 6. Wilson, Before the Flood, 20-21. 9. "Ballard & the Black Sea: The search for Noah's flood." 15 June 2005. <http://www.nationalgeographic.com/blacksea/>. 10. Wilson, Before the Flood, 18, 25. 11. Ryan, William and Walter Pitman. Noah’s Flood: The New Scientific Discoveries About the Event that Changed History. New York: Simon & Schuster, 1999. 14. Wilson, Before the Flood, 134. 15. Whitcomb, John C. and Henry M. Morris. The Genesis Flood: The Biblical Record and Its Scientific Implications. Grand Rapids, MI: Baker, 1961, 39th ed. 1994, 292. 18. Wilson, Before the Flood, 183-84. 27. “The Golden Lotus.” <http://www.egyptianmyths.net/mythglotus.htm>. 30. Vargas, Jose Antonio. “Seeking the Hand of God in the Waters.” Washington Post. December 31, 2004. Section C, Page 1. 32. Steinberg, Acts of God, xxi. 33. Wilson, Before the Flood, 250. 34. Waxman, Matthew C. “Strategic Terror: Philip II and Sixteenth-Century Warfare.” War in History. July 1997, Vol. 4, Issue 3, p339 (10). 35. Lary, Diana. “Drowned Earth: The Strategic Breaching of the Yellow River Dyke, 1938.” War in History, April 2001, Vol. 8, Issue 2, p191 (17). 36. “Water Conflict Chronology.” <http://www.sdnpbd.org/sdi/international_days/water_day/2005/content/water_conflictchronology.htm>. 38. Francis, Fred. “Water as a weapon of war: Analysts fear Saddam will sabotage Iraq’s dams.” MSNBC. March 19, 2003. <http://msnbc.msn.com/id/3070483/>. Cates, Curtis A. The Noahic Flood: Science and "The World That Was". Olive Branch, MS: Cates, 1994. Cohn, Norman. Noah's Flood: The Genesis Story in Western Thought. Yale University Press, 1996. Covey, Jon. “Catastrophic Plate Tectonics (Part I).” 15 June 2005. Dynes, Russell R. “Noah and disaster planning: the cultural significance of the flood story.” Disaster Research Center, Department of Sociology and Criminal Justice; University of Delaware. Nd. Ham, Ken. Genesis and the Decay of the Nations. El Cajon, CA: Master Books, 1991. Montgomery, John Warwick. The Quest for Noah’s Ark. Minneapolis: Pyramid, 1975. US Geological Survey. “Historical Perspective.” 15 June 2005. <http://pubs.usgs.gov/publications/text/historical.html>. Wilson, Before the Flood, 250. Waxman, Matthew C. “Strategic Terror: Philip II and Sixteenth-Century Warfare.” War in History. July 1997, Vol. 4, Issue 3, p339 (10). Lary, Diana. “Drowned Earth: The Strategic Breaching of the Yellow River Dyke, 1938.” War in History, April 2001, Vol. 8, Issue 2, p191 (17). Francis, Fred. “Water as a weapon of war: Analysts fear Saddam will sabotage Iraq’s dams.” MSNBC. March 19, 2003. <http://msnbc.msn.com/id/3070483/>.